AVIC-W6400NEX - Pioneer In-Dash 2-DIN 6.2 Touchscreen DVD/CD Receiver with GPS Navigation, HD Radio Tuner and Apple CarPlay. Built-in Bluetooth for hands-free calling and audio streaming. Works with wireless and wired Apple CarPlay. Fits double-DIN (4 tall) dash openings. AppRadio Mode for easy access to apps on the touchscreen. AppRadioLIVE integration with select apps. Siri Eyes Free control with compatible iOS devices. Wi-Fi Certified Miracast for wireless screen-mirroring. Pandora control through iPhone and Android. Free traffic updates in major metropolitan areas. Text-to-speech announces actual street names at turns. Plays CDs, DVDs, and USB drives. Plays lossless FLAC audio files (up to 192kHz/24-bit). 13-band graphic EQ with Easy EQ preset equalizer. Auto EQ with Time Alignment (optional CD-MC20 mic required). Low- and high-pass filters with adjustable crossover points. Advanced Sound Retriever enhances compressed digital files. You will be issued a Return Authorization Number. In order to maintain an inventory of 100%, Brand New, A-Stock, untouched products, all sales are final. We ask that you please be sure you are ordering the correct product. 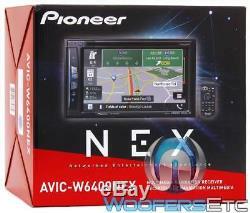 The item "PIONEER AVIC-W6400NEX 6.2 CD DVD BLUETOOTH HD RADIO NAVIGATION APPLE CAR PLAY" is in sale since Thursday, February 6, 2014. This item is in the category "Consumer Electronics\Vehicle Electronics & GPS\Car Video\Video In-Dash Units w/GPS". The seller is "woofersetc_outlet" and is located in Los Angeles, California. This item can be shipped worldwide.